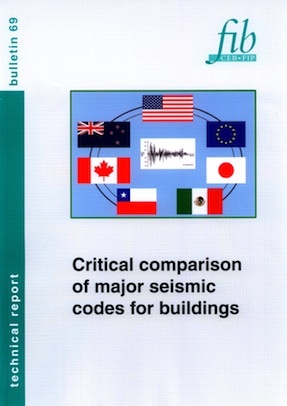 fib Bulletin 69 illustrates and compares major buildings seismic codes applied in the different Continents, namely U.S., Japan, New Zealand, Europe, Canada, Chile and Mexico. Bulletin 69 was prepared by Task Group 7.6 of fib Commission 7, under the leadership of the late Professor Robert (Bob) Park which, in tandem with Professor Paulay, had developed in the seventies new fundamental design concepts, most notably capacity design approach and structural design for ductility, that had made the NZ seismic Code the most advanced one of the time. This new approach has highly influenced the development of Eurocode 8, to which Bob Park has significantly contributed. Bob Park was also well informed of the situation in Japan, USA, Canada and South America. Such a wide view is reflected in Bulletin 69 showing similarities and differences among the major seismic codes, accompanied as far as possible by comments, hopefully useful for fostering international harmonization. A comprehensive summary of the major codes is provided in the first chapter of the bulletin. All codes are separately presented according to a common framework: an introduction section, which describes the history, the philosophy, the process development, the performance-based criteria, the strength of materials and the incorporation of strength reduction factors of each code; a second section devoted to the demand side, which specify the seismic design actions and associated criteria of each code for areas of different seismicity and for structures with different ductility properties/requirements; a third section devoted to the capacity side, which describes the capacities of members and joints and associated criteria of each code, including member strengths in flexure, shear and bars anchorage, desirable hierarchies of strength attainment, deformation capacities of mechanisms of inelastic deformation, detailing of beams, columns and structural walls, detailing of beam-column joints for shear and the detailing of diaphragms. The second chapter is devoted to the comparison of the more significant issues dealt in the considered codes. This includes: seismic design actions and associated criteria, capacity design practice, beams, columns, confinement, structural walls and joints. It is felt that fib Bulletin 69 represents a useful, unique instrument for rapidly gaining an overview of the distinguishing features of the major world codes, under both their conceptual framework and application rules.